I've said it before and I'll say it again; I...love...music. 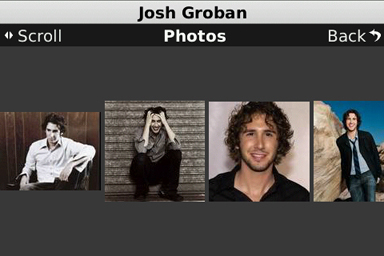 You'll always find a list of my personal favourites on my BlackBerry. They may not all be hits, or even well known, but they are "me". For the longest time, I've gone through the BlackBerry Desktop Manager to load up my Berry. I was never really happy with the time and process it took to complete the transfer. I'm not talking about gruelling hours of downloading, but fellow users and abusers know what I am talking about. PushLife introduced me to another solution; a solution that gave me more power over my media. Not only could I manage my media on my computer, I could also manage it on my BlackBerry. No need for wireless data usage, PushLife allows you to connect via USB. You can sync and update your changes in record time. Beyond being a music player, PushLife brings your media to life with images, lyrics, biographies, Twitter and more. Open up your media files and get ready to experience your media on another level. PushLife is brought to you by the company of the same name. The application is available for the 88xx series, Curve series, Bold, Tour, Pearl and Pearl Flip. The version I have running is 1.1.15, which requires 335.7KB. Make sure you also install PushLife on your laptop or desktop in order to use this speedy sync solution. 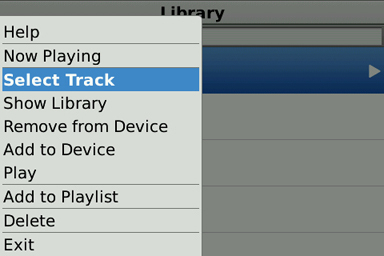 Oh and perhaps you should actually make sure you have some music or videos to install on your BlackBerry as well. PushLife is both a media player and a media manager. Rather than most one- way syncs BlackBerry users have experienced in the past, this two-way sync allows you to manage your media files using iTunes or Windows Media Player. PushLife supports the following music files: ACC, AMR, MIDI, MP3, WAV and WMA. The application also supports AVI, MO, 3GP, MP4, M4V and MPG files for your podcast, tv and movie needs. The desktop software will work with Windows 7, Windows Media Player 12 and iTunes 8 and above. Before you can start enjoying your media on the new player, you have to sync the device app with the computer app. In order to download media, your BlackBerry must be put into mass storage mode. Unfortunately, I wasn't able to access existing media on my device and SD card. I would have to transfer them from my BlackBerry to my computer and then back again. It's a bit of a hassle to do, but I thought I would give PushLife a chance. What I did enjoy was the ability to choose what media I wanted to download with ease. I could choose playlists, specific genre, even songs recently downloaded. And now for the BlackBerry portion of this tour. Once you have your BlackBerry brimming with media, open up the application. Due to more advanced features, the PushLife BlackBerry app takes slightly more time than the native Media Player. The opening menu of PushLife looks somewhat similar to your music player; you'll see the standard fields which include; Genre, Artist and Album. Above the fields, you will find two buttons you can easily switch between; Show All and On Device. These options give you slightly different views. For example- you can see specific playlist or genres. When navigating through the different fields, you can narrow your search by using the "Find" option found at the top of the screen. Just like the native media player, you simply type in the name of the album, artist or song title (depending on which field you are in). In a nut shell, you'll find that most media search options are very similar to the native player, only PushLife is much smoother. Rating: Marked by a star icon, this option allows you to rate the song currently playing out of 5 stars. This is done by scrolling left or right, changing white stars to yellow. This option also allows you to see the play count of the current track. Lyrics: Because you know how much you want to belt out the song, you might as well have the correct lyrics. This section is just text, where you simply scroll up and down to read the lyrics (and hopefully sing along as well). Just make sure you don't accidently serenade your boss at work. Biography: Want to learn more about who you are listening to? Want to discover their humble beginnings? Depending on the artist/band, you can scroll through a lengthy text of their history. Photos: Here, you can side scroll through images of the current artist from various origins. This option is a great idea. but could go further. The images tend to be small with no option to download or zoom while in PushLife. These images are stored on your media card and can be viewed in the photo album. On the plus side, the application will search the web for the latest images. Twitter: Ah yes- PushLife combining your musical life with your social life. From within the application, you can send off a tweet telling everyone what you are listening to. You have to log in every time you want to do this. While "Listening to *song name* "is entered in for you, the artist's name is not. When your followers see your tweet, they can purchase it from iTunes or listen to it online. There are many changes you can make to your media, such; managing playlists, renaming albums, artist or genres and editing song info. You can even queue up new music; select other for removal all from your phone. Once you sync your BlackBerry to your desktop, your changes will be synced as well. It's a fantastic way to manage you media, with as little effort as possible. PushLife definitely brings life to your media. It also gives you more control over how you manage them. Imagine making changes to playlists and media files on the go and sync them with your computer when you get home. Some features could be expanded upon, namely the photos section. I wish the stored images would be more organized; they made a bit of a mess of my photos. The UI was very smooth and easy to master. PushLife can be currently purchased from Handmark and Sprint for $9.99.